Peter was not quite five years old when his family left their ancestral village of Strohn, Germany and made the voyage across the Atlantic Ocean. He was accompanied by his parents Johann Adam and,Margaretha Lenertz Uelmen, his older sister Catherine, 16 and brothers Johann Adam, 11 and Nicholas, 9. New York ship passage records show the family traveled in steerage, They arrived aboard the ship “York” on July 2, 1857. Family and friends already in Wisconsin no doubt had advised them of the necessary arrangements to get them from New York to Wisconsin. Had selling their land in Germany given them enough money to make the journey or did the family in Wisconsin help out? Family lore states that the family settled in St. Michaels, Kewaskum, Washington county, WI. Johann was said to have been a farmer who brought and planted grape vines upon settling. Apparently the wine was either not any good or couldn’t be sold and the idea was abandoned. Today the area they immigrated from is dotted with wineries. 1858 records indicate that his father had begun the process of applying for naturalization. In April of 1860, at the age of 53, his father would die. Peter was left fatherless at the early age of seven. The cause of his death is unknown. I wonder if his death caused the family to regret their decision to move? In 1870 the census shows Peter’s mother, Magaretha, living with his older brother Johan Adam and his wife, at Armstrong’s Corner, Auburn township, Wisconsin. Margaretha’s brother-in-law Mathias Uelmen is also living in the same area with his son, Adam Uelmen (Johann Adam). The 1870 census shows Peter living in Menominee, Menominee county, Michigan. He is working in a sawmill and living in a boarding house. His age is listed as 17. Where his brother Nick was is unknown but he married Margaret Theusch at St. Michael’s church in 1872. In 1871 Peter had moved just over the Michigan border to Marinette, Wisconsin. He was working for the Stevenson Lumber Company. Marinettes’ proximity to both the Menominee River and Green Bay created a bustling timber industry. Most likely Peter had gone there to take advantage of the jobs available in the timber industry. All during the months of 1871 this area lacked for rain. The dry conditions were made worse by frequent sporadic fires. The residents of Marinette took to walking around town with clothes covering their faces as dust filled air became a way of life. Fevers and lung problems were commmon. Even so no one was prepared for the firestorm that would sweep through the area on the evening of Oct. 8th, 1871. The town of Marinette did not experience the wholescale carnage the town of Peshtigo suffered. But the fire encompassed a wide area not just Peshitigo. Marinette was within the bounds of the fire storm. Even if Peter didn’t experience the fury of the fire firsthand he was most likely called upon to help with the carnage left in the fire’s wake. Today it is still the worst forest fire recorded in North American history taking between 1200-2400 lives. Another fire occurred the same night in Chicago, perhaps because of a famous song about a cow kicking a lantern over, it is this fire history remembers but the one that raged across the lake was far worse. If you would like to know more about this fire you can consult one of the many good web pages dedicated to it. In 1868 a family by the name of Schleis immigrated from Bohemia and settled in nearby Carlton township, Kewaunee county, WI. They came with 5 children one of them a young girl by the name of Maria. In 1877, at the age of 20, she married Peter in Menominee Falls, MI. 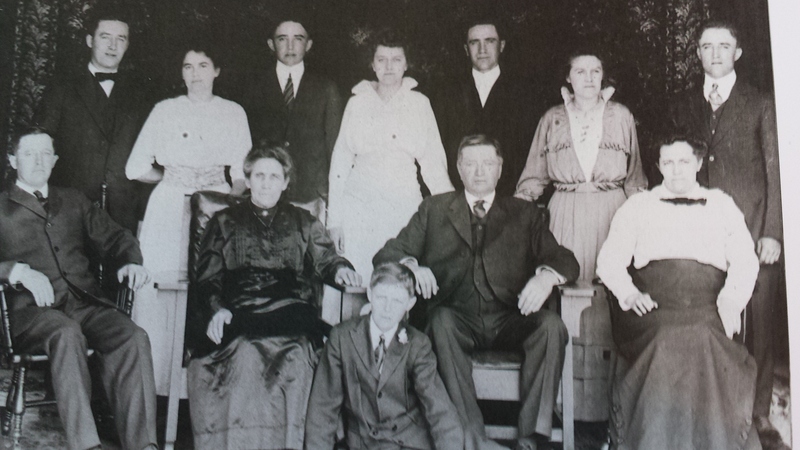 How they met or why they married in Menominee instead of her family church in Carlton is unknown. Perhaps Maria had gone to work in one of the logging camps. Peter by this time must have saved enough money to purchase his own farm back where his family lived. The 1880 census shows Peter and Maria living on a farm in the town of Auburn with two children, John age 2 and Barbara 11 months. Both children were born in Wisconsin. Peter’s mother is living with his sister Catherine in Kewaskum. Over the next two decades the family continued to grow. By July of 1900 they had 12 children ranging in ages of 22 to newborn. It was also around this time that Peter built his family a fine new American style farm house. It was this house and farm that later became the Meyer farm in New Prospect. His children are as follows: John b. 1878, Barbara, 1879, Anna b. 1881, Joseph P. b. 1883, Nicholas E b. 1885, Katherine b. 1887, Henry b.1889 (he was the only child to die young at age 4) , Rosalia b. 1891, Marie b.1893, Henry E. b 1894, Leo J. b. 1895, and Norbert b.1900. In the winter of 1915 he sold this farm to my Grandfather George Meyer and moved his wife and youngest children to Campbellsport, WI. In 1918 the Uelmen family received the alarming news that their son Leo had been seriously injured by a machine gun somewhere in France during WWI. I can imagine the worry and fret the family must have gone through while waiting for word on his recovery. Mr. and Mrs. Peter Uelmen received a message from Washington this morning, stating that their son Leo had been seriously wounded by a Machine Gun on March 22nd, “Somewhere in France.” The message does not give any further details. News from Fond du Lac this morning states that 46 Fond du Lac county boys were suffering from wounds, among them being Sergt. John Mohr, a brother of Mrs. L. H. Beiersdorf of this village. Peter was still living in Campbellsport when he suffered a stroke. He died 3 weeks later in July of 1926 at the age of 73. His obituary states that he had served as the assessor of Auburn township for 13 years and the assessor for Campbellsport for 6 years. He was survived by his widow and 10 children. He is buried in St. Matthews Catholic cemetery, Campbellsport, Wisconsin. This entry was posted in 52 ancestors in 52 weeks, Armstrong's Corner, Auburn twp. Washington Countyrb, Campbellsports, Fond Du Lac Countydn, Kewaskum, Kewaunee county, Marinette, Menominee, Peshtigo, Schleiss, Uelmen, Wi, Wis and tagged 52 ancestors in 52 weeks on October 19, 2014 by kwriter13.